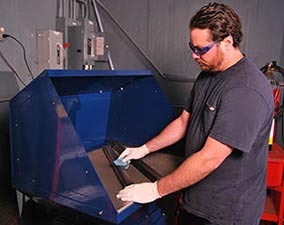 Downdraft tables can be a simple and effective source-capture fume extraction solution for applications such as solvent vapor control, solder fumes, light grinding, epoxy fume control, sanding, and a variety of other industrial applications. 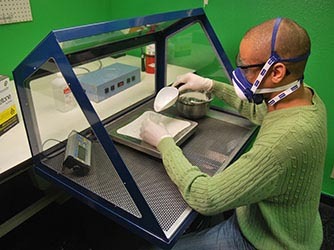 Our downdraft tables offer users flexibility, modularity, and durability for the capture and filtration of of the harmful particles and fumes left by these applications. These negative-pressure units are designed to pull harmful airborne contaminants away from the respiratory zone of the operator by utilizing high efficiency air filters, such as, HEPA, ULPA and ASHRAE. 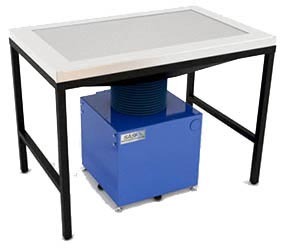 Sentry Air Systems’ line of industrial downdraft tables are well crafted stainless steel enclosures that are equipped with a powerful 700 CFM fume extraction system. These systems are designed to eliminate costly exhaust systems, reduce energy losses, and aid in employee protection by capturing the pollutants at the source. 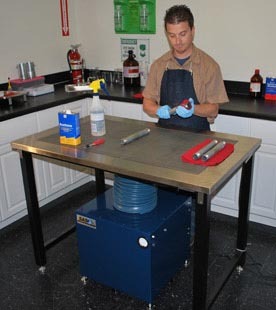 By utilizing high efficiency filters, such as HEPA, ASHRAE, ULPA, or activated carbon, the industrial downdraft table is best suited for high variance applications, including: Solvent vapor control, solder fumes, light grinding, brazing, and a variety of other industrial applications. 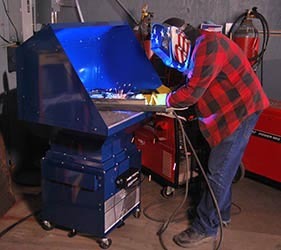 The Portable Downdraft Table is a height-adjustable source-capture solution for the extraction of fume, dust, and smoke at the work surface level. This safety engineering control helps to protect the operator’s breathing zone and surrounding environment from hazardous airborne contaminants. 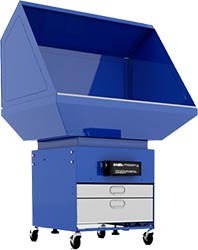 These units are designed for easy portability and flexibility within the work environment. Lockable casters make the unit easy to roll across a room and the no tool filter change design allows quick and easy filter replacement.